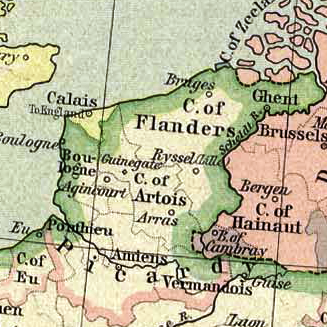 The English left the battlefield on 26 October and arrived at Calais three days later. The chronicles of Titus Livius and Pseudo-Elmham state that Henry stayed at Guínes Castle (an English held castle a short distance from Calais) on 28 October before making a ceremonial entry into Calais the following day. According to the Burgundian writers Le Févre and Waurin, the king was greeted outside Calais by the inhabitants who escorted him into the town where he was met with cries of ‘Welcome, our sovereign lord’. These same authors claim, however, that most of the English soldiers were deliberately prevented from entering the settlement by its inhabitants. This would have been understandable on the basis that the arrival of thousands of men would have put strains on the local supply, but as a result of this many soldiers suffered hardships despite having reached English territory. And on the morrow of the Apostles Simon and Jude, the said Nicholas Wottone, Mayor, and the Aldermen, together with an immense number of the Commonalty of the citizens of the city aforesaid, going on pilgrimage, went on foot to Westminster, and, having first made devout thanksgiving, with due solemnity, in the Minster there, for the joyous news that had then arrived, the said Nicholas Wottone was by the said Aldermen and Commonalty presented before the Barons of the Exchequer of our Lord the King, at Westminster, admitted, and sworn. According to the Chronicle of London the citizens then returned home on horseback ‘and were joyful and glad for the good tiding that they had of the king, and thanked our lord Jesus Christ, his mother Saint Mary, and Saint George, and all the holy company of heaven and said “Hec est dies quam fecit”’ (This is the day which the Lord hath made). The entry in the Letter Book makes clear that the pilgrimage on foot was not to set a precedent for the mayor of the city (it was customary to ride in state on such occasions). Instead this was an exceptional set of circumstances due to the joy experienced by the citizens at hearing news of the victory. Furthermore the pilgrimage was to honour God and his saints particularly that of St Edward whose shrine was at Westminster.